I like that as an in memory of. I still hear him in his litterbox in the bathroom, scratching around and tossing litter all over the floor. We miss him at night when he doesn’t sit by WM’s feet. I miss his big fatness crammed in between the sofa and the wall. We ordered this fat orange cat statue. 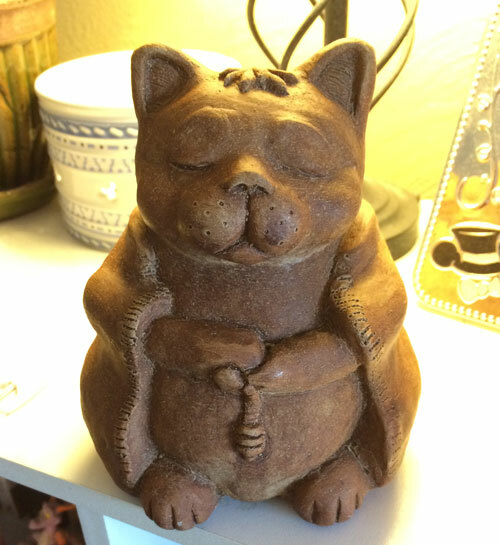 It goes with the meditating pig but more importantly it makes me remember my fat orange cat and smile. I enjoyed checking in on him for you. After you told me he liked feet, I would always be sure to sit on your couch, kick off my flip-flops and let Charlie get some happy foot rubs in 🙂 He was a sweetheart. I felt the presence of Ozzie and Cindy after we had put them to sleep. I still have Ozzie’s favorite toy and laid it beside him when he took his last breath. Cindy’s collar with the little bell on it is in the bookcase and I know I heard it jingle more than once after she was gone. It’s hard. I know.